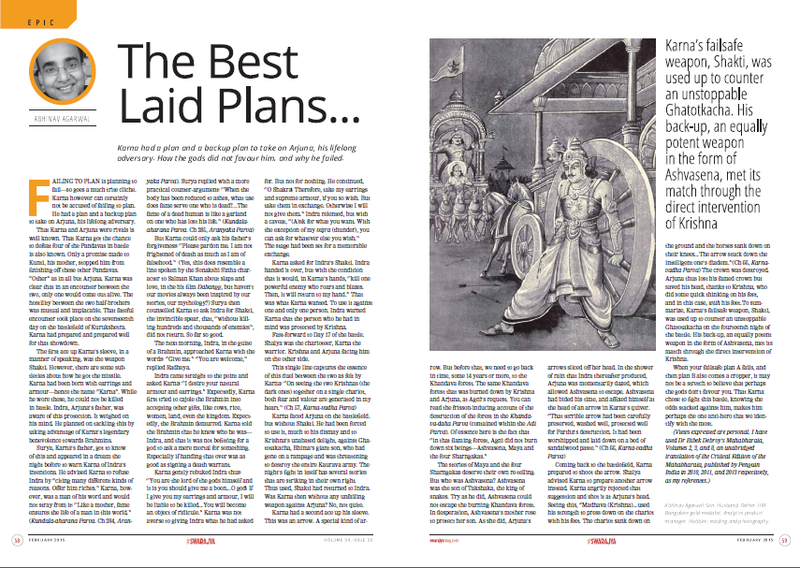 My eighth story from "Tales from the Mahabharata" - "The Best Laid Plans...", was published in the February 2015 print edition of Swarajya Mag. Failing to plan is planning to fail - so goes a much trite cliche. Karna however can certainly not be accused of failing to plan. He had a plan and a backup plan to take on Arjuna, his lifelong adversary. That Karna and Arjuna were rivals is well known. That Karna got the chance to defeat four of the Pandavas in battle is also known. Only a promise made to Kunti, his mother, stopped him from finishing off these other Pandavas. "Other" as in all but Arjuna. Karna was clear that in an encounter between the two, only one would come out alive. The hostility between the two brothers was mutual and implacable. That fateful encounter took place on the seventeenth day on the battlefield of Kurukshetra. Karna had prepared and prepared well for that encounter. The first ace up Karna's sleeve, in a manner of speaking, was the shakti weapon. How he got this weapon from Indra is well-known. However, there are some subtleties even there. We know that Karna had been born with earrings and armour - hence the name "Karna". While he wore these, he could not be killed in battle. Indra, Arjuna's father was aware of this protection. It weighed on his mind. He planned on tackling this by taking advantage of Karna's legendary benevolence towards brahmans. Surya, Karna's father, got to know of this and appeared in a dream the night before to warn Karna of Indra's intentions. He advised Karna to refuse Indra by "citing many different kinds of reasons. Offer him riches." Karna however was a man of his word and would not stray from it - "Like a mother, fame ensures the life of a man in this world." [Kundala-aharana Parva. Ch 284, Aranyaka Parva] Surya, on the other hand, made a more practical counter-argument - "When the body has been reduced to ashes, what use does fame serve one who is dead? ... The fame of a dead human is like a garland on one who has lost his life." [Kundala-aharana Parva. Ch 285, Aranyaka Parva] But Karna could only ask his father's forgiveness - "Please pardon me. I am not frightened of death as much as I am of falsehood." [Kundala-aharana Parva. Ch 286, Aranyaka Parva] (yeah, yeah, this line resembles a line from a Hindi movie, but haven't our movies been inspired by our stories, our culture, our mythology?) Surya then counselled Karna to ask Indra of his Shakti, the invincible spear, that "without killing hundreds and thousands of enemies" did not return. So far so good. The next morning, it thus came to pass that Indra, in the guise of a brahmana, approached Karna with the words - "Give me." "You are welcome," replied Radheya. Indra came straight to the point and asked Karna - "I desire your natural armour and earrings." Expectedly, Karna first tried to cajole the brahmana into accepting other gifts, like cows, rice, women, land, even the kingdom. Expectedly, the brahmana demurred. Karna told the brahmana that he knew who he was - Indra, and that it was not befitting a god to ask a mere mortal for something. Especially if handing that over was as good as signing a death warrant. Karna gently rebuked Indra thus - "You are the lord of the gods himself and it is you should give me a boon... O god! If I give you my earrings and armour, I will be liable to be killed ... You will become an object of ridicule." Karna was not averse to giving Indra what he had asked. But not for nothing. He continued, "O Shakra! Therefore, take my earrings and supreme armour, if you so wish. But take them in exchange. Otherwise I will not give them." [Ch 294] Indra relented, but with a caveat, "[A]sk for what you want. With the exception of my vajra, you can ask for whatever else you wish." The stage had been set for a memorable exchange. Karna asked for Indra's shakti. Indra handed it over, but with the condition that it would, in Karna's hands, "kill one powerful enemy who roars and blazes. Then, it will return to my hand." That was what Karna wanted. To use it against one and only one person. Indra warned Karna that the person who he had in mind was protected by Hari. Fast-forward to day seventeen of the battle. Shalya was the charioteer, Karna the warrior. Krishna and Arjuna facing him on the other side. Karna faced Arjuna on the battlefield. but without the shakti weapon. He had been forced to use it, much to his dismay and to Krishna's unabated delight, against Ghatotakacha. The night's fight in itself has several stories that are striking in their own right. Thus used, the shakti had returned to Indra. Was Karna then without any unfailing weapon against Arjuna? No, not quite. Karna had a second ace up his sleeve. This was an arrow. A special kind of arrow. But before that, we need to go back in time, some fourteen years or more, to the Khandava Forest. The same Khandava forest that was burned to ashes by Krishna and Arjuna, at Agni's request. You can read the frisson inducing account of the destruction of the forest in the khandava-daha parva (contained within the Adi Parva). Of essence here is the fact that "In that flaming forest, Agni did not burn down six beings - Ashvasena, Maya and the four Sharngakas." Coming back to the battlefield, Karna prepared to shoot the arrow. Shalya advised Karna to prepare another arrow instead. Karna angrily rejected that suggestion and shot it at Arjuna's head. Seeing this, "Madhava ... used his strength to press down on the chariot with his feet. The chariot sank down on the ground and the horses sank down on their knees. ... The arrow stuck down the intelligent one's diadem."" [Ch 66, Karna-vadha Parva] The crown was destroyed. Arjuna thus lost his famed crown but saved his head, thanks to Krishna, who did some quick thinking on his feet, and in this case, "with" his feet. To summarize, Karna's fail-safe weapon, the shakti, was used up to counter an unstoppable Ghatotakacha on the fourteenth night of the battle. Karna's back-up, an equally potent weapon in the form of Ashvasena, met its match through the direct intervention of Krishna. When your failsafe plan A fails, and then plan B also comes a cropper, it may not be a stretch to believe that perhaps the gods don't favour you. That Karna chose to fight this battle, knowing the odds stacked up against him, makes him perhaps the one anti-hero that people identify with the most. There is also the tale of Shalya, Karna's charioteer, who served as a double-agent, so to say, and undermined Karna's morale - that is another story or two of its own. Did you know - because Karna cut up his entire body to hand over his earrings and armour to Indra, he also came to be known as Vaikartana. Bibek Debroy tells us that Vikartana is the name of the sun-god, and the sun-god's son is Vaikartana. Disclaimer: Views expressed here are personal. Note: I have used Dr Bibek Debroy’s Mahabharata, Volumes 2, 3, and 8, an unabridged translation of the Critical Edition of the Mahabharata, published by Penguin India in 2010, 2011, and 2013 respectively, as my references. The Sanskrit shlokas have been taken from the online text of the Critical Edition of the Mahabharata, based on John Smith's revision of Prof. Muneo Tokunaga's version of the text at the Bhandarkar Oriental Research Institute (BORI), Pune.